YET, the world is filled with people and organizations that reject and rebel against change. People are fired, criticized or pushed aside for bringing change. Though change is not always embraced it is essential. Just ask the football team down at halftime but after making adjustments they go in the second half to win the game. Or ask doctors going into surgery expecting one problem only to find another. Or simply speak with the parents of children and teenagers. Change is rapid and required. Many churches today have not been willing to change. As a result, 80%-90% of HS Graduates are leaving the faith to never return. New generations are coming of age believing God and His Church are irrelevant. The North American Mission Board tells us that 80+% of SBC churches are plateau or declining. If these and similar statistics are to be reversed then the church must explore necessary changes. Ultimately, it boils down to the church recovering her purpose and mission. Purpose is everything, it clarifies your identity, gives focus for your future, and directs in your distractions. But what is the church’s purpose and mission? 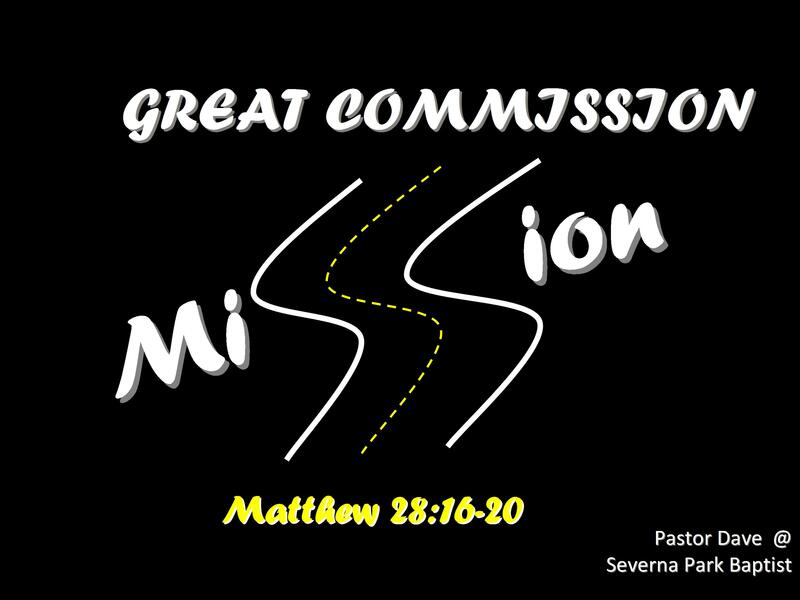 It can be found in the familiar passage known as the Great Commission, Matthew 28:16-20. People reject change because of their insecurities. They fear change because it shows what they are not or have never been. People do not want to be outside of their comfort zone. They are over-satisfied with status quo; complacency will always hate change. People reject change because of leadership incompetence. Leaders who fail to plan, communicate, follow through with implementation or stand ground when faced with challenges. My desire is for God to bring about change through a renewal of emphasis upon His Word, His Spirit and the Gospel. This familiar passage of Scripture helps us to understand the relevance of Christianity and to take it one step further, of the local church. After Jesus was crucified and resurrected he met with the disciples. He gave them final instructions to continue his mission. Jesus told the disciples he has complete authority in heaven and earth. This statement reveals the unique relationship between God the Father and God the Son. The Father and the Son co-equally share the position of power and authority as God. Even more, the Holy Spirit shares the same position as he resides in the life of believers. Understanding Jesus’ authority, the disciples of Jesus must aim for 3 life-targets. Jesus told his followers to make disciples. This is the only verb in the sentence/paragraph, meaning we have one primary task. Making disciples is modified by the statement “as you go.” This statement frees you from believing that you have to be gifted to preach, sing or write to be a “spiritual Christian.” You can make disciples in whatever area of life God has called you in. The key is realizing your career and abilities are given to you for the purpose of making disciples, not making a living. If you are not making disciples “as you go” then you are not following Jesus’ command and it may be that is a reason you can never find stability or satisfaction in your workplace. Make disciples by communicating to others who is Jesus Christ. We do this through our words and actions every day. Evangelism is not something you do by dressing up with white shirt and tie going door-to-door or necessarily what happens in a church service. Evangelism is Christians living life in a different way that makes others thirsty to know why, which is for Jesus Christ. Jesus told his followers to make disciples by baptizing them in the name of the Father and of the Son and of the Holy Spirit. Baptism is an outward act pointing to an inward reality – like a wedding ring. It connects you to something/someone beyond yourself, in this case Jesus Christ. Baptism not only means connecting to Christ but connecting to his church. Life in Christ does not exist outside his church. That does not mean your life becomes filled with “organizational church activity.” Church Membership Is Not Conversion To Christianity!!! However, the reverse should be equal. Jesus told his followers to make disciples by teaching them to obey everything he commanded. It is my opinion that Christianity has become marginalized and viewed as irrelevant in society because Christians have not allowed head knowledge become heart application. Our behavior has not followed our said beliefs. Jesus commanded the disciples to teach others to “obey.” Obedience to God’s word means more than casual hearing but that we would become catalysts of a greater movement of God than has been in the past. It means commitment and contributing towards growth in his Kingdom. Another word that may be used is “worship.” To obey is to worship God. Worshiping God or Christianity is not something you attend [i.e. building, event] but it is something you are through your lifestyle. Catalyst or Coward: If you are not serving as a catalyst for God it means you’re a coward not living out what you know you’re supposed to. Catalyze Strategically: Explore how God has gifted you spiritually to serve Him. Where does your greatest joy and the world’s greatest needs intersect? That’s where God wants you to serve. Catalyze Home: The best place to obey God and bring about life-changing transformation is in your home. Start with your spouse, children and family. Jesus leaves the disciples with the promise of his eternal presence, “I am with you always, even to the end of the age.” Jesus is Immanuel, God with us. It is a reminder that God is faithful and encourages us to continue in his work. However, it can also be a wake-up call to those who have been living life without Christ. The eternal God who has supreme authority in heaven and earth wants to be with you. Will you invite God into your life today? Christian, will you accept God’s call to complete obedience? What changes need to take place in order for healthy growth to happen? Perhaps change is already in place and your opposed… do you need to reevaluate and repent? The greatest change needed in your life is from relying on your self or anything else for salvation TO TRUSTING JESUS CHRIST. Will you make this desperately needed change in your life? Who are you communicating with about the gospel? How can we hold you accountable about this in a positive/affirming way? Are you connected to our church through a small group ministry? If yes, what is your role to help make the group more missional? If not, what can we do to help you join a group? Why are people afraid of commitment? “Commitment = Contribution”. Do you contribute your time, talents and tithe through the church? Anecdote from email newsletter by Josh Hunt, “How To Change A Church”.